Our job board and membership continue to grow! This month, we welcome Northeast Wisconsin Technical College as our newest Alliance member, joining our growing list of members in higher ed. We are also excited to announce that we have a new membership level – the Technology Advisory Membership. Technology Advisory Members will primarily be national organizations and institutions with a significant impact on the IT talent pipeline and that support IT functions, but who have a limited local presence. These organizations include suppliers, service providers, and technical recruiters. Technology Advisory members can only comprise 50 percent of the overall membership. The annual membership fee is $5,000. We are excited to announce that our first Technology Advisory Member is Microsoft. Learn more about some of their initiatives in Brown and Outagamie county here. The NEW IT Alliance is driving to attract, develop, and retain talent throughout northeast Wisconsin, and will be partnering with Microsoft where it makes sense in Brown and Outagamie County. Explore our Member Fees and Benefits under the Members menu, and contact us about membership today! Join us on November 7 for the first of its kind regional IT job and career fair, NEW Connect IT! This job and career fair is dedicated to connecting students to IT career pathways, and connecting employers to immediate and future employees. The event is open to high school students, college students, and community members interested in learning more and looking for opportunities in IT. We are hoping for strong turnout at the event. If you have an opportunity or event where the NEW IT Alliance could take five minutes to talk about the job fair and the benefits to students, companies, and the region, please reach out to Kim. Register your company for a booth, or simply to attend and learn more at newconnectit.com. The demand for IT talent in Northeast Wisconsin is alive and well. A quick look at the NEW IT Alliance job board reveals 43 IT job openings and 3 IT internship postings among our membership pool. Taking a broader look across our region, a quick search on Indeed.com for information technology jobs within 50 miles of Appleton reveals 1002 hits, 70 of which are new within the past 24 hours! If you’re having a tough time finding IT talent, you are not alone. Come to our next NEW IT Alliance meeting on November 9, and learn about IT Education in Northeast Wisconsin. We will have a panel of educators from our 2 and 4 colleges sharing everything you need to know regarding their IT programs. Find out which college to recruit business analysts vs. web developers from. Need to up-skill or re-skill your IT staff? Learn where to go to keep them current on ever changing technologies. Our regional educators are here to help with your IT talent challenges. Bring your questions, and share your needs. UW Oshkosh’s Information Systems program was featured in a recent article in the Oshkosh Northwestern that pointed out the disconnect between the need for additional people working in IT but few students pursuing the option. The Information Systems program has not seen an influx of students to match the demand. The IS program has two tracks – web and mobile development and enterprise technology and has grown slowly since the mid 2000s, despite strong job prospects and average starting salaries above $50,000. Read the full article here. Women in Technology is featuring Microsoft’s President Brad Smith at their October Breakfast meeting to talk about Digital Inclusion: What this means to Northeast Wisconsin and Beyond. In November, Alison Heiser gives a Crash Course in Design Thinking. For more information, check out their website www.witwisconsin.com/events. WIT Wisconsin is now offering consulting services. If you need help finding a volunteer, female speaker or anything that you may like WIT Wisconsin’s help with, please fill out the forms on our website under WIT4Girls page and Contact us. 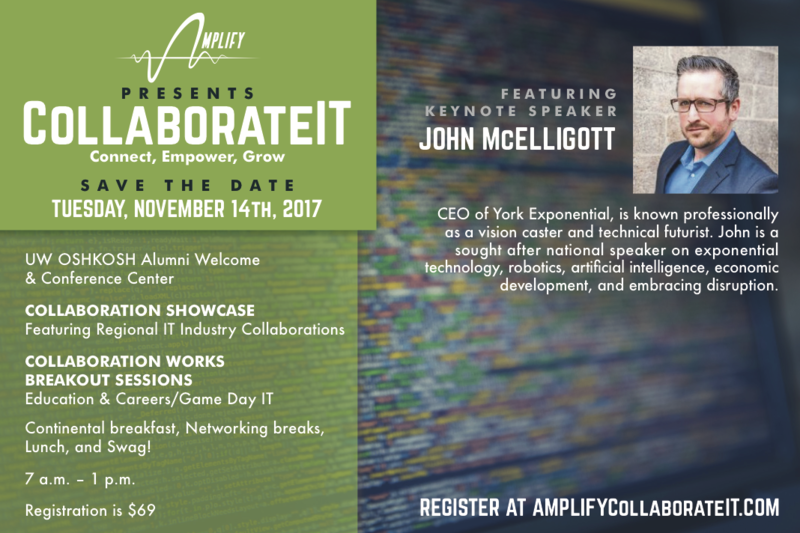 Join Amplify Oshkosh in welcoming John McElligott back for a second year at CollaborateIT! John will be returning to Oshkosh to give us an updated Crash Course on emerging technologies and what this will mean for us here in Wisconsin. He’ll uncover amazing breakthroughs, discuss how there are no passive participants in the 4th Industrial Revolution and remind us of a time when we all came together to face an overwhelming challenge and came out the other side victorious.